The 35 Scholars in 35 Days Challenge! Can you help us make a difference in the life of a child today? The Tapulanga Foundation is gearing up for the new school year once again. With the continuing success of our programs and the quality of education at St. Francis of Assisi School, more families are in need of assistance. We have 35 new scholars ready to start school in June. They have passed their entrance exams and our challenge is to find a sponsor for these deserving students - all 35 of them. Within 35 days. For as little as $30 or Php1,250/month, you can send a scholar to school for a year (school supplies, lunch, uniform and books included). You will get to know your scholar personally through letters and 100% of your donation goes directly towards their education. Please Join Us and make a Difference in a Child's life! Five years ago, the Tapulanga Foundation started giving college scholarship grants to graduates of St. Francis of Assisi School of Silay City (SFAS). Two of them have graduated while fourteen are still in college. Last March 31, 2012, five college scholarship grants were awarded to graduates of SFAS during their graduation. The Klaus Pfaender College Scholarship Grant is given by Klaus Pfaender, husband of Maricar Totengco, who is the sister of renowned fashion designer Rafe Totengco. Klaus and Maricar, like Rafe, have been committed donors of the scholarship program of Tapulanga Foundation for many years. Just this school year, during the 60th birthday celebration of Sir Klaus, he celebrated in Spain a dinner party and in liue of gifts, he asked his guests to donate to Tapulanga Foundation. And the total amount of gifts he received he matched so he was able to donate to the school $10,000 which went to the procurement of the big tv, home theatre system and two airconditioners in the AVR, two new computers in the lab and 2 college scholarship grants. Congratulations Nikko Sobretodo and Jessica Macahilig for being the recipients of the Klaus Pfaender College Scholarship Grants, a four-year college scholarship grant. Nikko plans to take up Bachelor of Science in Automotive in TUP, Talisay City. Jessica plans to take up Bachelor of Science in Education in Carlos Hilado Memorial State College, Silay City. The Corazon and James Chiofalo College Scholarship Grant is given by our alumni, Corazon Estardo, class of 1972, and her husband James. They now live in New York, U.S.A. Corazon is so proud to be an alumnus of SFAS and never hesitates in supporting the scholarship program of the foundation. Congratulations Jessica Estardo for being the recipient of the Corazon and James Chiofalo College Scholarship Grant, a four-year college scholarship grant. SFAS is proudest to have our very first graduate to be accepted in the University of the Philippines in Iloilo City. Jessica plans to take up Bachelor of Science in Biology. The Milou Locsin-Von Einseidel College Scholarship Grant is given by Mrs. Milou Locsin-Von Einseidel, a Silaynon and niece of the founder of this school, Mrs. Marietta Locsin-Ledesma. Mrs. Von Einseidel has also been a loyal supporter of the scholarship program of the foundation. Congratulations Claire Badian for being the recipient of the Milou Locsin-Von Einseidel College Scholarship Grant, a four-year college scholarship grant. Claire plans to take up Bachelor of Science in Business Management and Accountancy in the University of St. La Salle, Bacolod City. Presenting the award was Mrs. Juliet Graham. The last but not the least … the Akubo Software College Scholarship Grant is given by my brother, Robin Abello, who built Akubo Software, a web/cloud-based database and fundraising management system that is designed for small organizations. Akubo is a 100% Pinoy and Negrense product being used by hundreds of companies in the U.S. and is being used as well in the Philippines! Congratulations Eubie Aluad for being the recipient of the Akubo Software College Scholarship Grant, a four-year college scholarship grant. Eubie plans to take up Bachelor of Science in Computer Science in the University of St. La Salle, Bacolod City. In February and March 2012, the Guidance Office of St. Francis of Assisi School of Silay City conducted entrance test to all Grade 6 students of nearby public schools, namely, Adela Elementary School, Mambag-id Elementary School, Jose D. Cuaycong Elementary School and Hawaiian Elementary School. The purpose was to recruit students to study in SFAS in high school, offering full scholarship thru the Tapulanga Foundation. Congratulations to the following students who received a 6-year high school scholarship grant from the foundation. Executive Director, Micmic Golez, awarded them during their graduation. From Jose D. Cuaycong Elementary School, the top three in class, namely, Marlyn Bernasol, Angelo Singson and Nicole Joy Varela happily accepted the award last March 28, 2012. The class Valedictorian of Adela Elementary School, Angelico Abo, received the scholarship grant last March 28, 2012 as well. 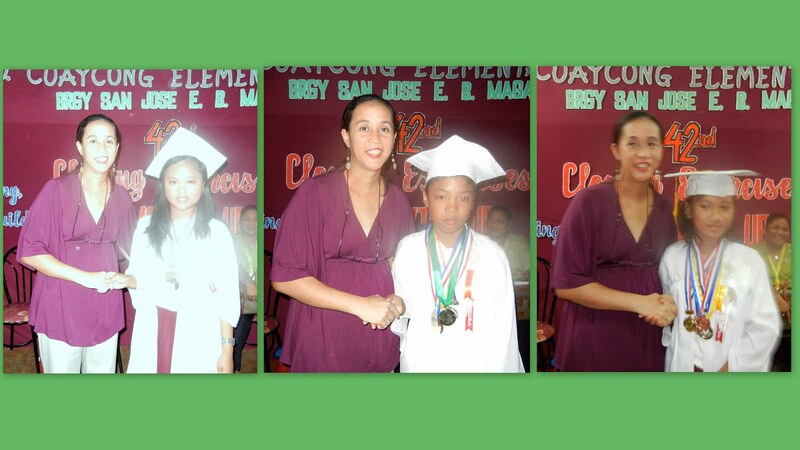 Ms. April Suating, guidance counselor of SFAS, awarded Christian James Salvacion, class Salutatorian of Mambag-id Elementary School last March 29, 2012. What a great surprise when Ro-an Andrada, a Tapulanga Foundation college scholar, received a laptop from one our most generous donors, Dr. Jone Chen! Dr. Chen has been a donor of the scholarship program of the foundation for many, many years and sponsors FIVE kids to study in St. Francis of Assisi School of Silay City! Ro-an was his first high school graduate. Ro-an shares that this is a dream come true not only for her but for her sister and cousin who are also in college. As college students, they need a laptop as most, if not all, projects have to computerized already. And her family cannot afford to buy a computer.